And how well we do all of this determines a great deal of our quality of life. Each day, each interaction is an experiment showing us what works and what doesn’t. So what works? What makes us better at feeling like we belong, that we are lovable and loving, and effective? For me personally, a critical shift happened through the example of Aikido, the non-violent martial art. In Aikido I saw and felt the power of finding the stillness at the center of my own torus energy field and I discovered the boundless capacity that opens up when we blend and lead rather than try to manipulate and control. I committed myself to becoming as skilled as possible in the art of communication, because it is at the heart of every relationship. I read and practiced. I did workshops, therapy and studied with experienced teachers. I learned that skillful listening is an even more advanced art than effective self expression. I remember reading a study that said that in determining whether or not to trust another, on average, we pay attention 57% to the tone of the person’s voice, 25% to their body language and only 18% to their words. I learned that being open didn’t mean being more at risk. I learned keys to authentic forgiveness that can free the psyche, relax the body and help heal or prevent disease. I learned that whereas having to be “right” led to conflict and isolation, being honest, caring and complete in communication led to being alive and being in love. I applied what I had learned from practicing Aikido to my relations with myself and others and eventually became a conflict resolution facilitator for couples, families and schools as well as corporate and sports teams. For fifteen years I led programs called Interaction Dynamics. I have appended an outline to the course here for those who are interested. It is more effective with intensive coaching on the different concepts and skills, but you can still get some key distinctions from the outline. Am I fighting against the fact that things, in this moment, are exactly the way they are? Starting by accepting (not condoning or settling, just realizing) creates the Aikido “blend,” which is necessary before a “lead” is possible. Am I doing everything that is in my power to change the situation for the better? Am I shaming, blaming, whining, manipulating... or am I actually staying connected at a feeling level with the person with whom I am challenged at the moment? I find that clearing with myself inside is usually a necessary component for clearing a relationship breakdown with someone else. And the conversation – within me and with another always needs to be voluntary, not coerced. When I was fortunate enough to come into relationship with my wife, Kimberly, it was like a home-coming. Her listening was so deep, her compassion so unconditional, that I just felt like I could be fully myself with her. My last doubt disappeared about what is possible between two humans. In fact, my greatest hopes were exceeded. I found out that loving, trusting, co-creative partnership is in fact all it’s cracked up to be and more. It is not for nothing that we humans long for this. It is the call of the mighty oak to the tiny acorn, the inexorable pull to fulfill our full potential. This happened for me pretty late in life. I think there is a significant role of good fortune if we meet that person in this lifetime at all, but the more important question, I think, is “How do we prepare ourselves for it?” How do we use the power we do have to do our part in being ready? Learn to be more and more in harmony with your body, emotions, mind and others. Get trained in and practice effective communication. Be aware you, like everyone, operates from a worldview made up of your beliefs. Keep opening your mind, so you minimize contractions that would limit full sharing with another. Be as clear as possible on the qualities you are looking for in a partner – and make sure you are developing them in yourself. Lighten up. Enjoy your relationships with others and all life. Keep your eyes, ears and heart open, and when you think you might have met that person, listen, share yourself whole-heartedly, listen and then listen some more. The waves, the tides, and gravity. Relationships are altered but not necessarily confined by physical-ness. Think how much we are still relating to a loved one who is travelling, or whose physical body has died. We have all heard about the profound psychic connection between twins – even at a distance, but that interconnection seems to be there, on some level, for all life. The quality of our relating is determined within us...and then gets its expression depending on how skilled we are. I was fortunate to be in a think tank with Cleve Backster, author of The Secret Life of Plants, in which he measures the non-verbal connection between plants, shrimp, and human cells – even separated by concrete walls. And when we’re not it feels edgy, frustrating, competitive, superficial and threatening. "Traditional marriage, based on social duty, and modern marriage, based more on hopes for perpetual romance and happiness, have both led to certain dead-ends. What new ground can we find beyond both hope and duty, to nourish and sustain a deeper more satisfying love between couples?" And here are some deeply helpful insights from Gay and Kathlyn Hendricks' book, The Conscious Heart. “We have identified seven waves of spiritual growth and awareness that occur as relationships deepen. These waves occur in couples of all religious backgrounds—or no religious background—and cut across racial and ethnic lines. They seem to be universal, whether or not we know about them. We think of them as waves of several reasons. Like waves, they are predictable yet extremely variable. If you go to the ocean, you can count on waves being there, but you cannot count on how close together they’ll be, or how rough. You can also learn how to be with wave: You can learn to surf on them with the right equipment, or you can turn your back on them hold your breath, and take what you get. This latter move does not affect the wave, but greatly affects your experience of it. We recommend that you try the surf option” (pg 83-4). “The first wave begins in that magic moment when two people experience their initial moment of attraction. Sometimes this moment is charged with a galvanic snap of sexual attraction. Sometimes it begins with a mutual recognition on the mental, emotional or spiritual level. However it occurs, the two people awaken to new possibilities in themselves and the other. They experience their own essences—who they really are—at a deeper level. They feel more real inside, and they open the field of all possibilities in the other person” (pg 84). “Many people we’ve worked with compare the second wave to sleep. They felt a great awakening in the first wave, then promptly went to sleep. During the deep sleep of their conscious intentions, their shadows—those unexamined and unowned aspects of each person—emerged and obscured the real features of their loved ones. Old patterns took over, and intimacy dwindled— a fog came over the relationship. When essence is obscured, the first symptoms are usually subtle and can be overlooked. The second wave can roll in the first time you don’t say what you want and instead go along with what you assume your partner desires. You can also usher in this wave when your partner does something you find irritating and you don’t tell the truth about how you feel about it. This wave of power struggles: Whose version of reality will become dominant in the relationship?” (pg 86). While you are asleep at night, your body may twitch and struggle with an imaginary opponent. In the waking dream world of a close relationship precisely the same process occurs when you are going through this most unconscious of phases. The central dramatic motivator is the struggle for common control. Essence has become so obscured that the partners go on automatic; each tends to require the very behavior in the other that drives them crazy, and both entrench the relationship in an escalating drama. In the third wave the partner’s tend to polarize. The fog of the second wave solidifies into masks. The forceful partner becomes the dominator; the shy one sinks into the loner role. Unacknowledged fear created this distance, escalating it until the partners look like strangers to each other. They cannot imagine how they made such a bad choice. Since most of us don’t know how to shift from fear to love, the first tendrils of fear grow into a tangled bramble through which it seems virtually impossible to see each other clearly” (pg 88- 89). “Our culture tends to reinforce this wave by promoting the view that people need to compromise, that romance withers, and that partners need to learn to settle for less. But in our explorations with couples, we have found that people can shift from power struggles and dream dramas to seeing and supporting essence” (pg 91). “Like the sun peeking through clouds as they break up, essence grows as the partners choose the relationship over conflict time and again. Essence becomes the field in which relationship dramas unfold. You begin to see what you are bigger than your dramas: You have dramas, but they no longer have you. You see that you are making all these dramas up, that you are the source of them. As you claim responsibility for them, you also open up your ability to create freely, to choose what you really want” (pg 92). “Through making the courageous choice of having relationship harmony over being right, and making this choice repeatedly until it becomes second nature, the personal experience of essence takes hold” (pg 95). “People in successful long-term relationships tend to develop an ability to let go of attachment to their own points of view. In other words, they learn to handle the universal addiction to being right. Many couples founder in the fourth wave because they do not develop this ability. When the pressure is on, each of them chooses being right over seeing and supporting essence. A great deal of the work in the fourth wave involves partners making graceful exits from the points of view in which they are stuck. As one couple put it, ‘What saved our marriage was learning that there was life beyond being right. We were both so attracted to making each other wrong that it seemed like a life- and- death struggle. What a relief when we found that it was entirely unnecessary’” (pg 96). “A rat who runs down the tunnel that has the cheese in it will choose another tunnel if it stops finding cheese at the end. But human beings are different We will keep going down a cheeseless tunnel for years. Why? Because we believe in it. We think it’s right, even through it doesn’t have any cheese anymore. We’ll defend it until the end, even discarding friends of many years who suggest that there’s no payoff for our efforts” (96). In this wave you no longer take struggles as seriously as you once did, because you are identified more with you own essence than with the part of you that is addicted to the struggle. Also, you can see your partner’s essence clearly, even when you are struggling together. Conflict does not disappear in this wave; it simply becomes absorbed in a larger version of yourselves” (97). “One buoy in this fifth wave is ease: Partners shift readily from fear to essence. They develop a real skill at surfing. They choose bigger waves to ride, and they turn fear into excitement with breath and truth. Compassion blooms. Each of them sees through the survival filters that the other has erected, and they appreciate each other’s essence qualities” (97). In this wave a true partnership forms. We become connected through our essence, not our personas. A genuine mutual creativity develops where both partners can express themselves creatively from essence. During the conflict and power struggle of the earlier waves, they could not look toward the horizon together, toward what they want to create. In the sixth wave both of them are more committed to the horizon—to realizing their mutual goals—than to the drama of conflict. They’ve also become more permeable to getting feedback from each other” (99). “No longer addicted to conflict and drama, the partnership now rests in essence and lives on a continuous wave of rebirth. 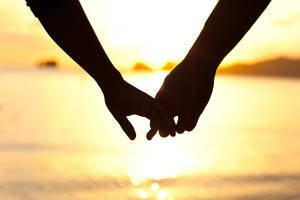 Creativity, appreciation, abundance, and rekindled romance characterize the union. The partners notice an increase in synchronous flow, in which what is needed appears and daily tasks move smoothly and easily. Paula, whose relationship is in the seventh wave told us: ‘What seemed possible that hadn’t previously occurred was a union of true equality. A union of mutual respect, equal energy exchange and input, equal willingness to grow, to be close, to ‘meet’ the other. Actually, we seen to naturally and effortlessly meet each other, and that ease was an exhilarating surprise.’ Time seems to expand, so that everything can happen without strain. In our research on approximately three thousand couples, we have identified about 5 percent as being in seventh wave partnerships. At first glance, 150 couples out of three thousand may not seem like many. But many take heat— we have to start somewhere, and compared with our parents’ generation or our grandparents’, perhaps 5 percent is not doing too badly. We hope these figures will inspire you to try to reach the seventh wave rather than depress you. After all, only about 5 percent of the citizens participated in the American Revolution, and look where we ended up just a couple of hundred years later” (100). We are each a work in progress — in relation to ourselves, with one another and in our connection to the life force, the cosmos…to spirit itself. I hope you find benefit in some of these tips and I invite you to share your own learning experience and most beneficial resources in the comment thread below.